Some character designs are good, some are great. And some are such a perfect combination of all things cool that they transcend the boundaries of the physical world. 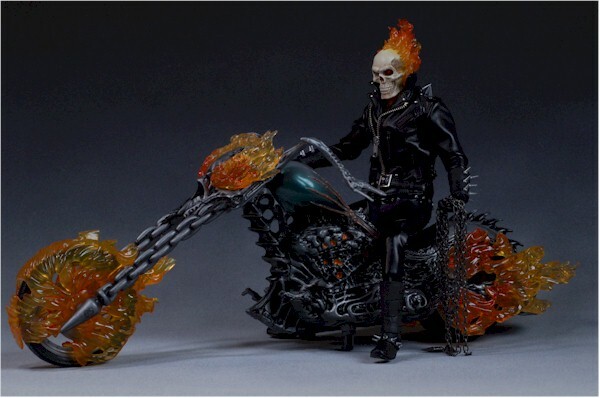 Okay, so maybe not - but Ghost Rider is damn close. Biker's are cool. Skeletons are cool. Flames are cool. Combine these three things and you have uber cool. Now, lest you think you can just take various things that are cool, combine them willy nilly, and you'll end up with magic, let me remind you that while motorcycles are cool and Darth Vader is cool, we've already seen the atrocity that is Darth Vader on a motorcycle. It's also possible to over combine, taking a cool idea too far. 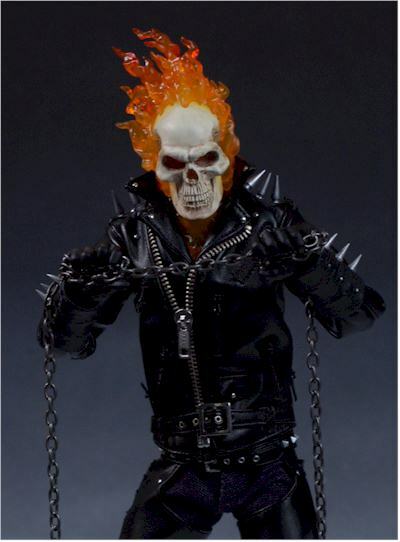 Ghost Rider goes right to that edge…but doesn't tip over. 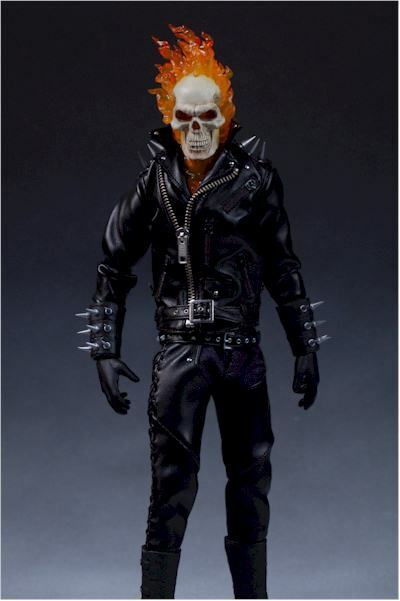 Pirates are cool too, but give Ghost Rider a peg leg and you'll end up with a Spawn character. And so it was with much anticipation that the Ghost Rider movie opened this year. It's not a bad film if you turn off the sound, and keep your focus on Eva's cleavage and the Ghost Rider effects. But I don't think Spider-man has to worry about GR bragging around the country club about his franchise's success any time soon. 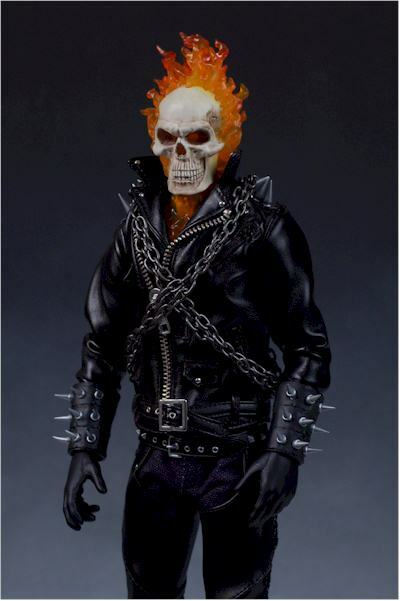 On the plus side though, the release of the movie meant lots more Ghost Rider collectibles hit the market, many of them based simply on the character and not on the film in any specific way. One of those goodies is the sixth scale figure from Medicom. He's currently out there on the market, running around $100 at release time. I have some cheaper suggestions at the end of the review. Medicom boxes tend to do two things really well. 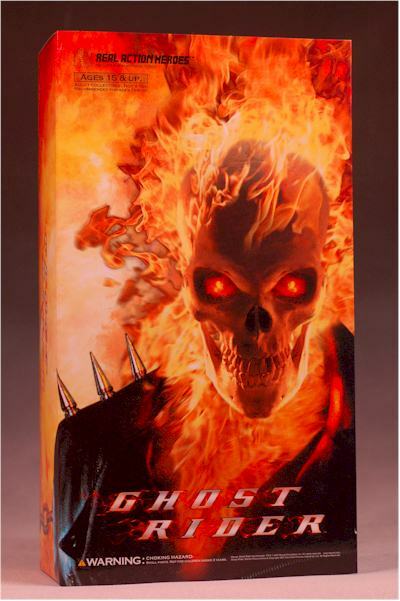 They are usually compact (at least in recent times), and the Ghost Rider packaging follows that pattern. I consider this a big plus for two reasons: a) it saves spaces for those who are MIBers, and for those of us that keep the box for future figure storage and b) it's good for the environment. As grannie always said, "waste not, want not." Or was that "waste your neighbors if you want"…grannie was a bit unpredictable. Medicom packaging is usually very collector friendly too, making it easy for you to open up the figure and display it, play around a bit, but put it back later just as good as new. Again, this box follows that tradition with no need to damage anything in the process of removing him from his prison. But Medicom packaging is generally somewhat bland. Oh, they aren't ugly by any stretch of the imagination, but the graphics and artwork are usually pretty general and safe. But this time they've done an excellent job on the front of the box, going with an artistic interpretation of the toy that looks smashing. So they're getting the extra points for the extra effort this time. The head sculpt isn't quite as cool as the prototype - but that shouldn't surprise anyone at this point. It's still extremely nice, especially the flames effect. The flames are flowing out backward from his head as though he's moving forward, or he has a breeze coming straight at him. 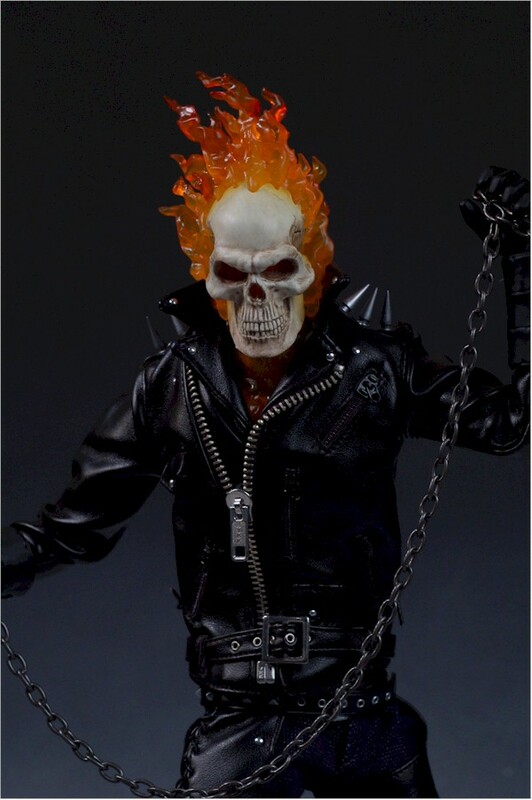 The flames are some of the best we've seen on a any Ghost Rider figure, including the recent Hasbro versions. 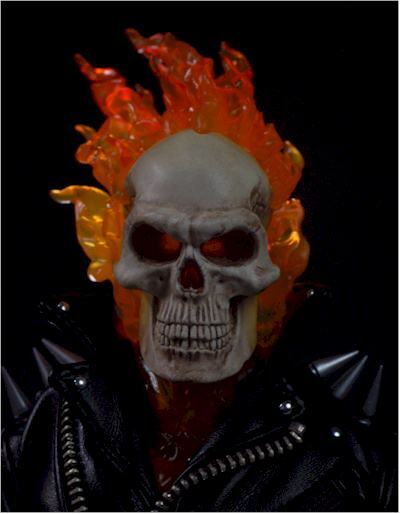 The flames also flow around the head and down the front of the neck onto the torso. These flames are made from a softer, translucent rubber, and the material works quite well. The skull isn't quite as evil looking as some other versions, partially because of there is a little less black (and more gray) around the eyes. This isn't a bad thing though, because any light focused on the flames will travel down and light up the interior of the eyes. Excellent! 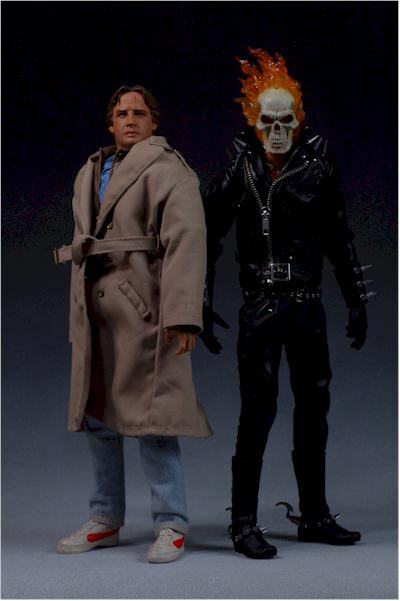 The head sculpt is also a little large, particularly if you're comparing this guy against the movie version, where the skull was more in scale with an actual human skull on a full sized body. But the detail work is quite good, and this guy is extremely photogenic. The standard hand sculpts are designed to be slightly fisted, just enough to work with tons of poses. The sculpting on other areas includes plenty of spikes, and these are generally well done if a bit soft. I noticed that it was quite easy to bend the ends of the spikes on the boots and gauntlets, so take a little care. Fortunately, they bend back pretty easily too. 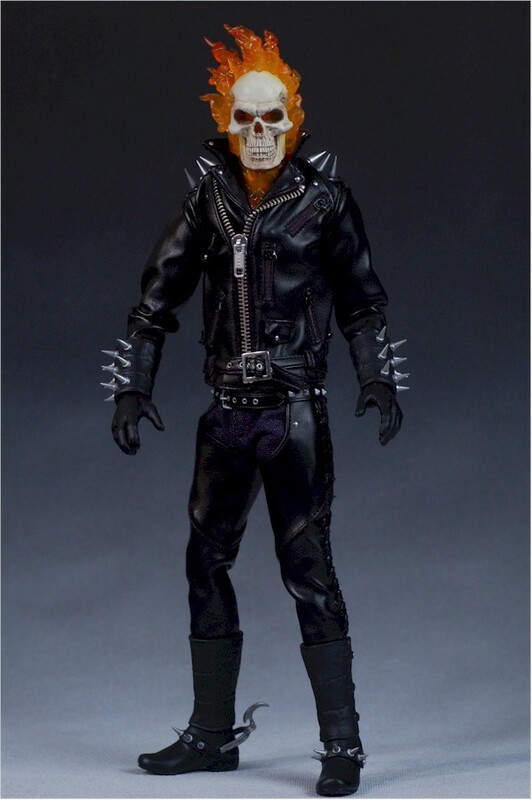 He stands at about 12 1/2" without the flames, making him the 'movie' size comic book Medicom body. The 'book' comic characters are shorter. He fits in fine with other sixth scale figures, and is actually a better fit on the Hasbro bike because he's larger than the Icons version. There's not too much paint work here, but they did do a good job where necessary. The wash on the face is a bit light, but for folks that complained about the Hasbro versions being over done, you'll be pleased. I'm one of those folks that thought the Hasbro was was at times a bit much, and I think it works much better here. The fact that the wash didn't effect the flames and eyes is a huge plus. The flames are cast in this funky red/orange/yellow rubber plastic, and the color works great. It also allows for a lot of light to pass through, making them even more flame-like in appearance. You won't even have to have a directed light on it - room light even works to some degree. The silver goodies, like the spikes, buttons, etc, are well done and clean, although again it's not a stretch. Medicom didn't do anything amazing, but instead stuck with making sure quality was there in all the simple ways. If you do basic things extremely well, customers will notice and respond. In another example of how Medicom pays attention, they cast the arms in black, even though the likelihood of any part being exposed is almost nil…yet they cast the torso in a yellow. This was particularly smart, since it avoids any funky dark color showing through the translucent flames on his chest. GR sports the standard Medicom body, so he has the ability (for the most part) to take on lots of great, natural poses. My current soap box on articulation is that companies need to focus less on adding more articulation and focus more on getting the current articulation to be more realistic, so that any poses have a more natural feel. Medicom is one of the companies that is doing this quite well. However, GR does take one giant step backward. Because of the rubber flames that run down his neck and onto his torso, the neck articulation is zero. Oh, you can get the head to turn a *smidge*, but certainly not enough to make a difference. It also means no jaw articulation, which any skull sculpt is just begging for. Without the neck articulation, you lose a huge number of poses. Fortunately, the rest of the articulation is the usual top notch work, and the costume is much less restrictive then you might assume. The soft leather allows the arms and legs to hold most poses, and the waist and chest joint can make up a little for the lack of any neck articulation. The outfit also sports some articulation! The spurs on the boots can move up and down slightly, which was a nice surprise. GR comes with three goodies, plus the clear Medicom display stands. Most folks I know really like these stands, but the good news (to me) is that you won't need it if you don't want to use it. Only extreme poses will require the stand to keep him upright, and you can find plenty of realistic, threatening and dangerous looking poses that won't require the stand. Like most Medicom figures, he comes with a couple swappable hands. These are slightly fisted, allowing him some gripping options that work particularly well with the chain. The hands swap easily enough, and there's no chance you'll break the sturdy posts. I did find that the hands tended to fall off a little too easily, pushed off by the tight gauntlets. But it was a fairly minor issues at best. Ah, then there's the aforementioned chain. This thing is nice and long, clocking in at almost three and a half feet. It has the plumb bob end on it, so that will come in handy if he's refinishing his basement with studs and dry wall. The chain is also metal, and not cheap, composite plasticy metal, but stick to a magnet like a mother metal. The only downside is that the chain itself is a little small scale-wise, the links being a tad undersized. They aren't ridiculously small, and too small is better than too big in this case, because as soon as the chain starts to go in the other direction and get too large, it becomes very cartoony and toy-like quickly. The real metal also would have weighed down his arms had the links gotten too large, making some of the cool poses more difficult or even impossible, so I can live with the size. The outfit is the usual complex, well tailored, high quality costume we've come to expect from Medicom. It has one issue for me, and I'm betting you noticed it right away. But let's leave that issue til the end. The outfit includes a great set of soft rubber boots, with sculpted details and spurs included. These fit well, and the tight leather biker chaps fit inside nicely. These chaps have a cool lacing up the exterior seam, and also fit perfectly. These are made from actual leather, just like the jacket, and have a soft, smooth feel. Under the chaps are jeans, visible only around the crotch. I'm not sure if they run the whole leg, but they sure look like it. The leather jacket has all kinds of cool little pockets, and the actual zippers all work. Yep, those itty bitty zippers are all real! The gauntlets fit over the jacket arms tightly, and have a nice sculpt, and the spikes on either shoulder are attached very tightly, so no worries about anything popping off over time. The regular studded belt looks fine, and fits around his waist with a little slack. There's a metal hook that works as the buckle, and it's very high quality. I had a minor issue around the belt of the jacket though, which tends to ride up on the body. This is related to the minor issue around the spikes on the shoulder, which tend to slope off too much and not stand up quite straight. These issues are related because they both are caused by the tight fit on the lean body underneath. You really need to bulk this guy up a bit with some tissue paper place in crucial spots around the shoulders and waist, and once you do you'll have a much better looking final result. I didn't shoot photos that way because it wouldn't be a fair assessment of the figure out of the box, but I certainly recommend giving it a try once you have him. Those issues are minor though for me, because they're correctable if you want to take the time. A much bigger issue for me is that HUGE front zipper on the jacket. The fact that the other small zippers on the jacket are actual working zippers makes it even more confusing as to why they used such an out of scale and obvious silver zipper for the front. Had they scaled this zipper back just a bit, this outfit would have easily grabbed four stars. You're probably not going to buy a hundred dollar figure for your eight year old to play with, but the nice thing about this figure is that it hasn't lost sight of its toy roots. Great articulation that is sturdy and solid, great quality work on the outfit, and sensible accessories - a kid could have fun with this guy. 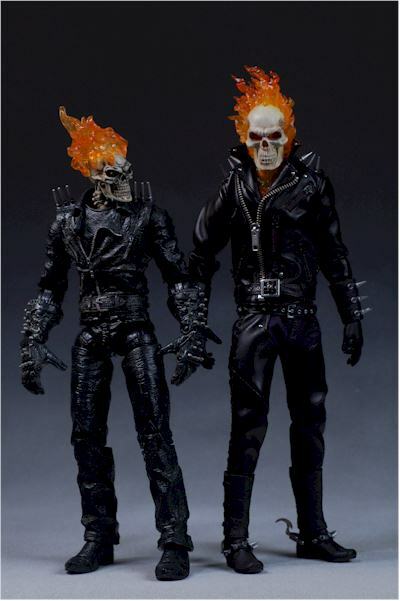 But, being the fiscally responsible and sensible adult you are (okay, so the fact that buying a hundred dollar Ghost Rider 'doll' might put that in question with your friends and family, but to Hell with them), you'll buy the Hasbro 12" Ultimate Ghost Rider and Flame Cycle for your son instead. And then steal the bike from him, since it looks so damn good with this figure. I'm grading this guy at a hundred bucks, the general going rate. At that price, you'll feel like you got what you paid for - not an amazing value, but you certainly won't feel ripped off. Get this guy down under $90, and you can add another half star, but go over $110 or so, and cut a half star off this category. No issues at all for me. Obviously, you can improve the appearance of this guy with some futzing outside of the box, but there's nothing to be worried about in terms of breakage or issues. 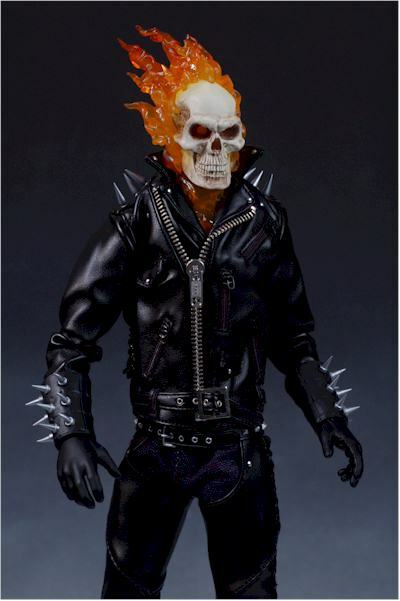 This is probably the finest clothed sixth scale Ghost Rider we've gotten so far. Okay, he's got a few nits, and that damn front zipper is driving me nuts. And yes, the loss of the neck articulation is a mighty big blow, certainly big enough to hold him back from any top honors overall. But I'm betting most GR fans will be happy with the purchase, especially if they can get this guy down in the sub-80 dollar range. There are really two issues here - the lack of any neck articulation, and the huge zipper. If you're cool with those, you'll be cool with him overall. 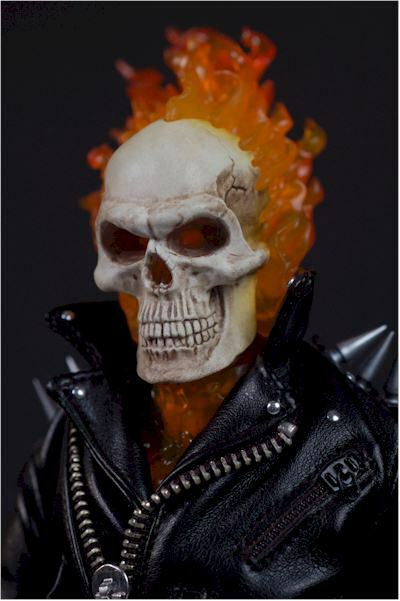 I'm still VERY happy with my Ultimate Ghost Rider. Hey, at half the price of this figure you get a great figure AND an amazing bike! But if you're looking for something of a little higher quality, and prefer the real clothes, then the Medicom treatment is the direction you need to go. Or do what I did, and buy both so that you're Medicom GR can have a cool bike to impress the chicks. 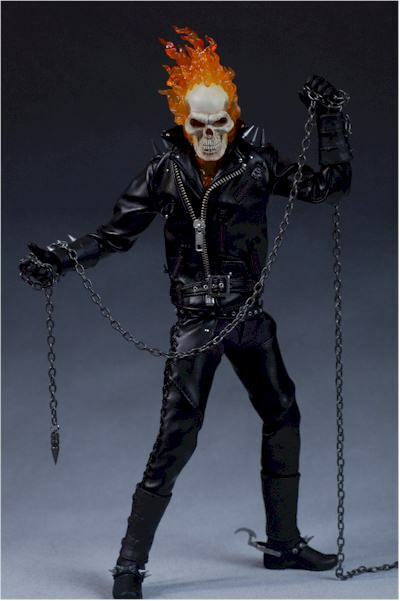 - CornerStoreComics still has him listed as in stock at $85. That's an excellent price for this guy, so I don't expect they'll last too long. - Dark Figures still has him available at the $99 list price. - In the U.K., Forbidden Planet has him for 80 pounds. 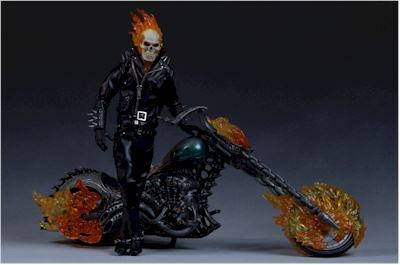 - if you pick up only one movie related toy, make it the Ultimate Ghost Rider with Flame Cycle. - I also reviewed some of the smaller movie figures from earlier in the year. - and I recently reviewed the movie based mini-busts of Mephistopheles and Blackheart.